Starting your own business is no mean feat. But when every one of your products is slurped, munched and fervently photographed by the general public, it takes a special kind of businessperson to throw open their doors. Will Pearce and Rebecca Toppin’s doors have been wide open for almost a year now, however, and their family-run cafe, Robinsons, is already a big hit with the locals — as well as enjoying a reputation for fantastic food on TripAdvisor. We sat down with co-owner Will to talk about what it takes to get a business like his off the ground, as well as to ask if he had any advice for those toying with the idea of setting up shop for themselves. We came away with a deeper understanding of the challenges small business owners face when it comes to maintaining a social media presence, as well as a new insight into the benefits of working closely with other local businesses. Originally from Darlington in North East England, Will and Rebecca previously worked at a number of high-end establishments as a restaurant manager and chef, respectively, before deciding to become their own boss. When asked what it was that inspired them to go into business for themselves, Will told us about how competitive the hospitality industry had become and the many years of service that even the most skilled chefs are required to put in before they're able to call the shots for themselves. “We always worked to a high standard — Michelin-starred places, five-star hotels," Will told us. "It was getting to the stage where we developed quite a range of skills, but we would have had to be there for another ten, twenty years before we’d be able to get to the very top." It was this shared desire to be free to make their own decisions — as well as the lure of being able to boast having a chef with Michelin star experience in their kitchen — that prompted the pair to go it alone. Enticed by the city’s popularity as a tourist destination and thriving universities and colleges, Will and Rebecca eventually settled on York as the site for their business. 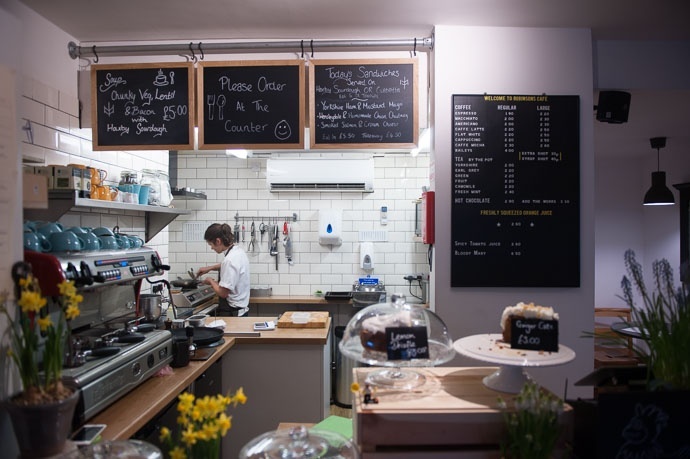 Borrowing Will's mother's maiden name (as well as her waitressing skills), Robinsons opened for business in April 2016, a desire to use local produce and keep the field-to-fork journey as short as possible at its heart. Today, Robinsons sees an average of 500 patrons a week, with chef Rebecca sometimes firing out just shy of 150 meals in a single day. It was always Will and Rebecca’s intention to work with local businesses, but the degree to which Robinsons would come to rely on the shops and people right on its doorstep took even its owners by surprise. 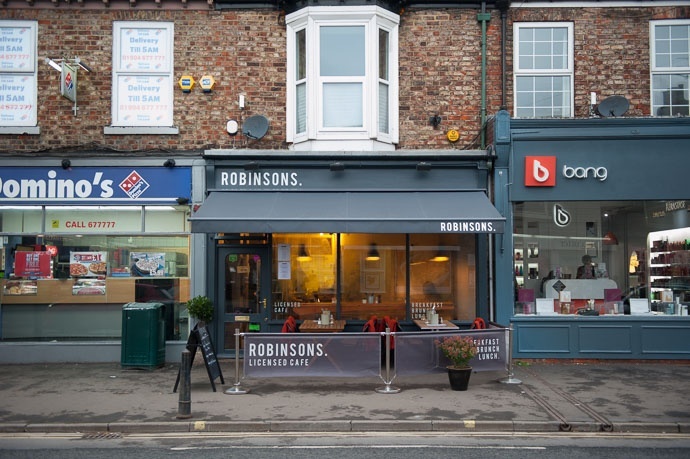 Located on Bishopthorpe Road — a street located just outside York's historic city walls and voted Great British High Street of the Year in 2015 due to its plethora of independently owned businesses and vibrant street parties — Robinsons is surrounded by shops and places to eat and drink. Before too long, these same outlets came to form part of a vital support network for Will and Rebecca's cafe. “To begin with, we were thinking of broader Yorkshire — making sure we always cook with rapeseed oil instead of olive oil, that kind of thing," said Will. "But it’s kind of come down to us using everything on the high street." 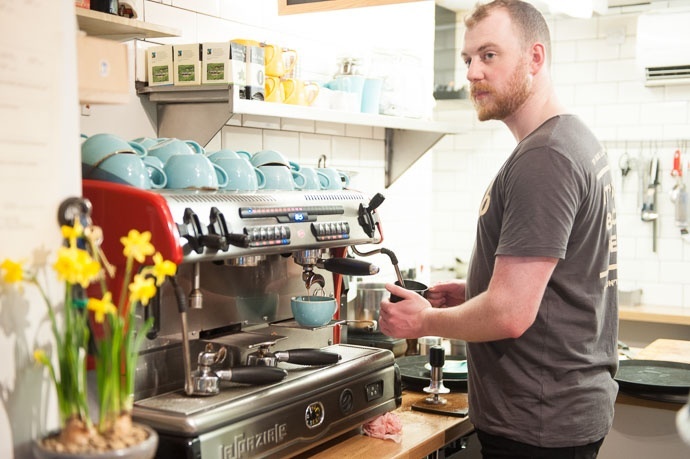 Robinsons' success so far is testament to the power of cooperation between local businesses. In the Starbucks era, where things like coffee, cakes and snacks are readily available on every other street corner — often at prices lower than independent businesses could afford — it can be difficult for the little guy to compete. But where businesses like Will's have the upper hand is with the opportunity to join forces with those around them. 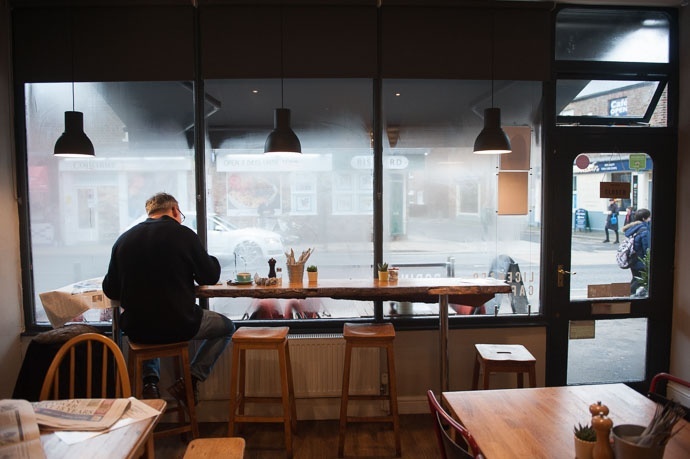 The shops in the local area help keep each other afloat, with even the relative new kid on the block quickly becoming a valued part of a larger network. "Everybody supports everybody else," Will said of 'Bishy' Road. "We shop on the high street not just for the business but because we live here. The butchers get their breakfast from us every day — we get all our meat from there too, for home cooking as well." Clearly, it pays to keep your friends close and your fellow business-owners closer. Even with such a prime location, however, getting the cafe off the ground wasn’t quite as simple as setting up a few tables and popping the kettle on. “The paperwork,” replied Will with a sage nod when we asked him about the biggest hurdle he and Rebecca faced when getting their business started. It’s this same feeling of frustration that scuppers many a plan and forces would-be small business owners to put their dreams on hold. Nothing stubs out an idea faster than legal issues and masses of paperwork to file. “Bex and I have got the skills so that, once the business is actually up and running, it’s easy for us to run it. I mean, it’s hard work, but we know what to do," Will said. "But to apply for all the licenses that you need, all of the inspections from the council, who do you contact? Who do you not need to contact?" With Robinsons staffed by just Will, Rebecca, and Will's mother, Cathy, we couldn't help wondering how they managed to stay on top of the business' various social media accounts, all of which are packed full of delicious-looking photos — and even a few videos, such as the time Rebecca cracked an incredible 18 double-yolk eggs in a row. It's not uncommon for smaller business owners, keen to have a strong social media presence but lacking the time required to build one up, to ask an agency to take care of it for them. When we touched on the subject, however, Will told us that he felt quite strongly that retaining full control over Robinsons' social media output was the right thing to do. “I think it’s important that we do social media ourselves rather than [hiring] a company," he said. "I’ve worked for places, some good restaurants with celebrity chefs, and the chef has employed a team to do social media for him. And you can just tell straight away. “If you look at people like Sat Baines on Twitter, Daniel Clifford, some of those chefs, they post a lot of pictures of things like them going to the gym or something like that. You feel like you’re a part of their world. Clearly, the biggest problem small business owners face is finding a middle-ground between wanting to remain hands-on with their social media output and having enough hands free to actually do so. Nevertheless, Robinsons' social media pages, even when they're updated only a few times a week, are always well curated, with plenty of pictures of finished dishes, fresh ingredients — and even the occasional mishap. While on the subject of engaging with customers online, we asked Will about the approach he took to responding to customer reviews on TripAdvisor. His philosophy is refreshingly simple: leave the good ones be, and don't let the bad ones ruin your day. “I constantly get emails [from TripAdvisor] encouraging me to reply to reviews," he said with a slight shake of his head. "But I don’t reply to the positive ones because I feel that they speak for themselves. The people who write them know that we’ll see them and appreciate it. Thankfully, Will doesn't have to worry too much about negative reviews at this point — the vast majority of Robinsons' reviews are either "Excellent" or "Very Good", with some sparkling reviews from locals and tourists alike. Should something go wrong, however, Will tries to keep a level head. "If it was a genuine mistake and something did happen, then we’d just have to hold our hands up and apologise. But I’d hope that, if something that terrible happened, we’d be able to deal with it here in the cafe — and that I’d be able to see it. We’d see something like that before it got to the TripAdvisor stage and be able to rectify it." It's also important, Will tells us, to know when to let a negative comment go. "I feel that TripAdvisor is one of those things that you just have to take with a pinch of salt. You can’t let it ruin your night." Before leaving, we asked Will what kind of advice he'd offer his former self if he were able to go back in time armed with the knowledge that he and Rebecca now have. Elaborating on the wobbles he and Rebecca had in the early days, Will smiled and told us about some of the 'suggestions' they received prior to opening. "We did get a letter through the door saying, 'Make it a children-free cafe.'" he laughs. "At the start, every guest that came in had an opinion on what we should have on the menu, but we stuck to our guns." Clearly, they're good guns to stick to. Huge thanks to Will for taking the time to talk to us about Robinsons, and for a splendid flat white. 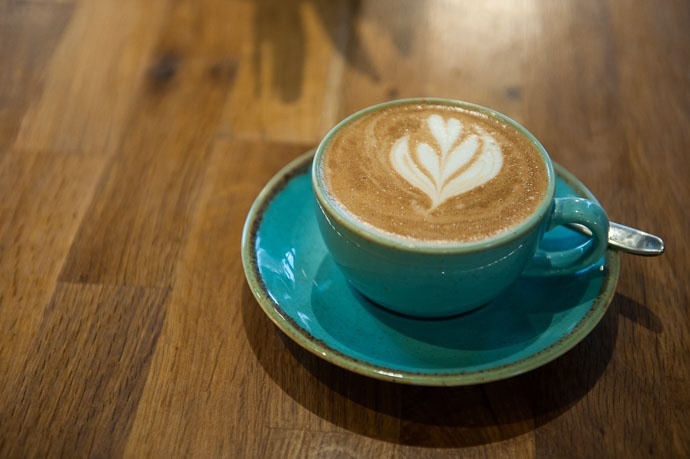 Visit Robinsons' website for more information about the cafe and to follow them on social media.